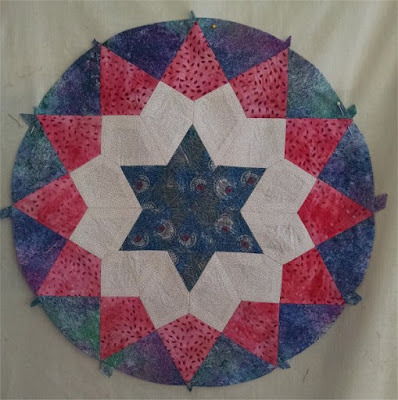 Yup, here it is, in all its glory ... the next completed half-star! This makes #3 of 8. Fabrics #2 and #3 were 'donation' fabrics, in that they were given to me by a quilter who was purging her stash. They are perfectly good fabrics; the prints are simply something that I wouldn't have normally chosen for myself. Work on half-star #4 is progressing onwards. 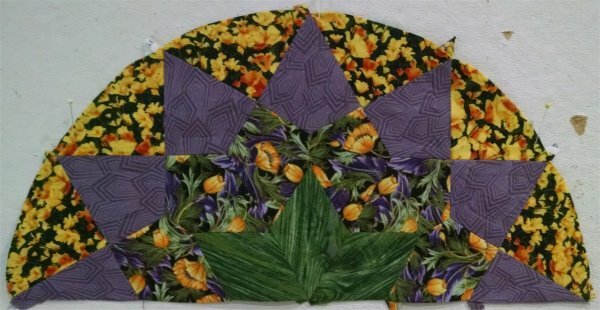 Having finished all my full Stash Busting Stars, I have turned my attention to the half-stars that are needed for the layout. Here is the second half-star I've completed. And then ... listen to my tale of woe. Woe is me. (there's more). The quilt project that I am currently working on is out of my comfort zone. Yes, I did intentionally decide to do this. It's a (for me) artsy-fartsy sort of design of leaves "blowing in the wind" but in a controlled sort of way. Additionally, I am using some rainbow ombre quilter's lamé fabric, purchased God knows when or from where. I had about 1/4 yard and that was *IT*. There's not a glimmer of a chance of getting more, so that is exactly how much fabric I have to work with. Therefore, I cut out exactly as many leaves as I could ... and that's all there is. Period. I gotta make this design work with the number of leaves in the colors that I have. After looking at lots of inspirational pictures, I came up with a design that I kinda/sorta like and can live with. It's not as dismal at you might think because, having no original design gene in my make-up, I never "know" what exactly to do, so everything is shades of "can I live with this?" And the design I came up with was on the "yes" side of that question. But, the design felt as though it needed an "anchor point", so to speak. I figured a green stalk would hold down the design in an asymmetrical sort of way. I do have a shimmery green fabric in my stash but it's more of a remnant than yardage and was nowhere near the amount that I needed for this stalk. So, I went shopping online. I figured some shot cotton would be cool and I found some. While I was waiting for my order to be delivered, I came across a design that *immediately* jumped out at me and said .. OH YES! THIS IS THE DESIGN TO USE! Not only was I so pleased to be enthusiastic about it, it happened to be a free tutorial! With the pattern! Oh, hooray, hooray! This design is a lovely, lovely bare tree trunk and branches with leaves scattered all over. It was a MUCH better design than what I had come up with. I eagerly started reading the tutorial only to find that the design had found the process of getting her pattern pieces to the publisher (she apparently had it published at some point) rather difficult because the design is just so large that she point-blank told her readers that there was no way she could provide the tree pattern on the blog and her Dear Readers should simply ... *draw it freehand*. Oh My Goodness. But now ... if you remember .. I've already ordered the green stalk fabric. It's on it's way and can't be cancelled. Tree trunks are NOT green. Unless they are covered with moss and even then, there's some "tree trunk" color showing through. Sooooooo ... since my leaves are ombre rainbow anyway (and not real leaf colors), should I just use the green fabric for the tree trunk? It'll look rather surrealistic. Or should I put the green shot cotton into my inventory for another project and go looking for some brown tree trunk fabric? Would a realistic brown tree trunk go well with rainbow colored leaves? Or should I just leave the tree green because the whole image is preposterous anyway. :-) I'll think on it. Looking at the clearance section ( ... LOOK at how much money I'm saving by purchasing it on SALE!! :-) ), I saw a very soft butter yellow fabric that, in my mind's eye, would work rather nicely with the stars that I have made. Unfortunately, I ran into a problem when I added the butter yellow fabric to my cart: they didn't have enough of it for my background. Aaarrgghh. Back to the clearance section ... and I found a white-on-white design that would suffice. The fabric was ordered and my life moved on. Several days later, my bundle of joy arrived in the mail. Hooray! This was my green stalk fabric and my butter yellow background! Oh yes, I could definitely see that butter yellow as the background! It was going to be so pretty! But wait, you say. Didn't you actually buy the white on white? Well, yeah, but my one remaining brain cell hadn't remembered that. To say that I was 1) puzzled 2) annoyed and 3) disappointed when I pulled out 7 yards of white on white is an understatement. Then I remembered why it was white on white and not butter yellow. Unfortunately, my brain is still fixated on the butter yellow. It's not really *liking* the white on white. And I'm stewing. My mind is frowning. What can be done to remedy this situation? BUT WAIT!! A solution has been thought of!! Dang, I can DYE THAT FABRIC! I've dyed white on white fabric before and it comes out a wonderful tone-on-tone because the printed white design absorbs the dye differently than the base fabric. When the dyeing gets done, it will be a yellow tone-on-tone in a very unobtrusive sort of way .. and it will be *fantastic*! Yay, me! :-) So, *that* project needs to be done before I can proceed with using it as the background for my Stash Busting Stars. Wow ... I have FINALLY completed my very LAST full Stash Busting Star! It was 5 months ago in September 2016 that I started this project with the VERY ambitious plan of doing a star a week. O.M.G. A star a week. How formidable a goal was that? Reality certainly set me straight in short order. But, I have now finished 11 full stars and 1 half star. I must admit that even though I am certainly capable of dedicated working on a project for many months .. even years ... 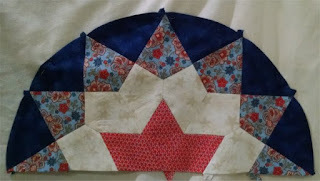 I am kinda tired of working on these full stars. Luckily, I need only 8 half stars .. and one of those is already made. Half stars should go twice as fast as the full stars, right? 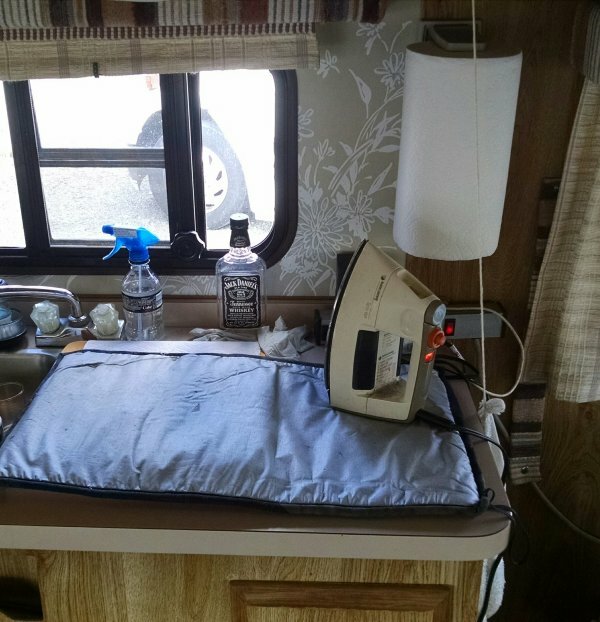 And then ... this past weekend, Dear Husband and I stayed at Skyline Wilderness RV Park in Napa, CA. It's nearby to us but we had never been there before. It's a gorgeous low hill area that abounds with trails to walk on, paths to ride your horse (bring your own!) and even has an archery range (bring your own gear). Due to an unfortunate car mechanical problem, we were unable to enjoy Saturday at our leisure but Sunday was just for relaxing. The weather wasn't quite as nice on Sunday as it was the previous day but Dear Husband decided to go for a "walk" anyway. I had prepped for this particular project by cutting all the pieces at home, labeling and bagging them. 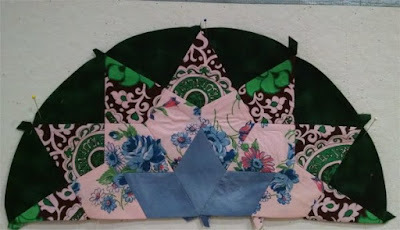 I was very pleased to have been able to use my flannel scraps/remnants to construct the top ... including the background. 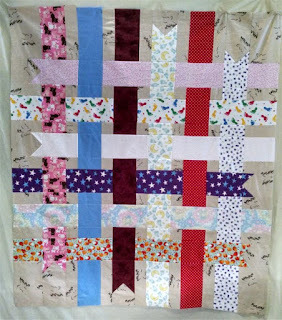 The pattern, "Ribbon Box Quilt", a freebie available from Cloud9Fabrics.com, was easy enough to sew together .. provided that you paid attention to which piece was going where! 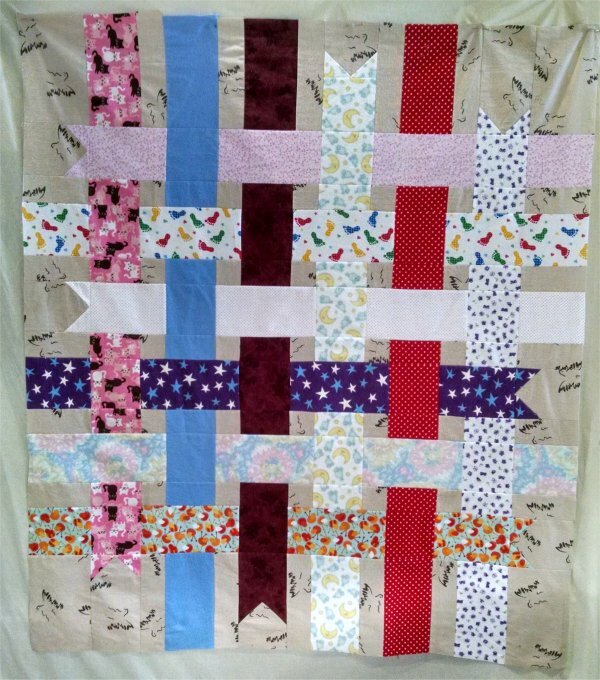 The overall layout was woven ribbons, so if you got a piece out of place, the entire effect would be ruined. This was the first time that I actually sewed *inside* the trailer. All of my previous sewing endeavors have been outside on a table. But with the cold temperatures and sporadic wind, it was much better for me to be inside. I was able to sew all afternoon and made excellent progress. When Dear Husband returned from his walk (uphill both ways, of course), we went out for dinner. 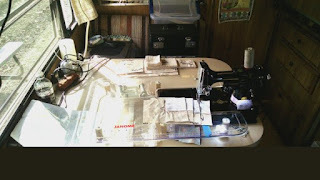 After that break, I continued with sewing and was able to finish the top that evening. Back at home, I found an extra wide piece of flannel to serve as the backing (seamless! score!) and I made the double fold bias binding so that when this top eventually gets quilted, it can be bound in short order.